Carl's Jr. and Hardee's restaurants are not only comforting you with cheese and bacon, but also with hours of comfy thoughts in your online world. Now you can become a fan of "The Comfort Place" or download an actual application that will put "24 Hours of Comforting Awesomeness" on your Facebook wall. 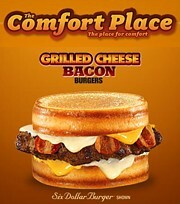 Now you can become a fan of "The Comfort Place" or download an actual application that will put "24 Hours of Comforting Awesomeness" on your Facebook wall. As awesome as that all sounds, I think they had us with just the burgers.